The article discusses the problem of the absence of qualifying academic programmes for translation teachers who have to resort to their own intuitions and to a so-called folk pedagogical approach. It aims at identifying the underlying understandings of the nature of knowledge and learning that are behind the traditional ‘Who will take the first sentence?’ teaching practice as well as alternative didactic approaches. While there are some motivating and inspiring publications on innovative learner-centred teaching methodologies, they still lack any discussion of pedagogical epistemology or any general educational principles or theory. The main thesis proposed in the article is that in order to move forward, translation educators need to establish a dialogue with the broader domain of educational theory and praxis, with educational epistemology being a sensible starting point for this dialogue. To set the stage for such a dialogue, the article offers a brief overview of three major epistemological trends: empirico-rationalism, constructivism, and emergentism. ©inTRAlinea & Donald Kiraly (2014). "From Assumptions about Knowing and Learning to Praxis in Translator Education"
Ceci est un énième plaidoyer, parce que ce n’est pas la première ni certainement la dernière fois que l’on s’inquiète du fait que les formules pédagogiques choisies par les formateurs de traducteurs, en ce qui concerne les interactions dans les cours pratiques de traduction, en particulier, n’ont pas beaucoup changé au cours des cinq dernières décennies (Echeverri 2008: 67). The present essay might be considered an n+1 with respect to Echeverri's article. Having been involved in a quest to contribute to improvements in translator education over the past thirty years, I have taken multiple opportunities in publications, workshops and conference presentations to revisit conventional instructional praxis in the translation practice classroom amidst the backdrop of teaching and learning that in translator education remain largely outside the pale of what I call the community of thought and praxis in the general field of education. Whereas, for example, school teachers of mathematics, science, religion, history and languages are trained around the world within academic programmes that focus on the theory and praxis of teaching and learning along with their respective subject matter per se, translator education remains on the periphery of the general discipline of education, and is still largely dependent on teachers' intuitions about what it means to know and learn, or what Jerome Bruner (2006) has called 'folk pedagogy', and that Bereiter and Scardamaglia (1993: 188) describe as a 'common sense epistemology'. Of course, many fields of study in higher education suffer from a pedagogical (or actually androgological) deficit in the sense that lecturers and professors at university often have no special training or education in the art of teaching (or facilitating learning -- which some of us see as a viable and worthy complement or alternative to teaching per se). While no one surely would contest the folly of having a chemist, physician, mathematician, engineer, pharmacist, dentist, psychologist or anthropologist draw solely on common sense or folk understandings of chemistry, medicine, mathematics, engineering, etc... as the ideational basis of their professional activities, university lecturers are often expected to do precisely that. We participate in curriculum development, create lesson plans, devise and implement approaches for promoting the acquisition of knowledge essentially on the basis of our own prior professional experience as language mediators – and generally, our own prior experience. In the absence of degree programmes for translation teachers, that fundamental academic forum is lacking for in-depth discussion about pedagogical epistemology, classroom praxis, or testing procedures among the community of translator educators. Without a true field of 'translator education', I contend, there can be virtually no identification of shared principles, only minimal collaborative work on principled approaches, and no ongoing, systematic assessment of teaching practices. It is true that conference presentations, workshops, journal articles, and other publications provide considerable food for thought for the community of translator educators, but the creation of qualifying academic programmes in translator education is still a major desideratum. Despite or perhaps because of the lack of translator educator training, I am sure that most translation teachers as well as current and former students of translation will be very familiar with the conventional approach that Echeverri went on to critique in his paper and that Christiane Nord (1996) discussed at length in her so aptly titled article: ‘Wer nimmt denn mal den ersten Satz?’ (Who will take the first sentence?). The folk pedagogical approach that both of these scholars were criticising involves having students attempt to accumulate knowledge of proper translation procedure, technique and strategy on the basis of their teachers' intuitive input and correction by the ostensibly more knowledgeable teacher of the students' faulty rough translations. The teacher is clearly seen as the authority in the classroom (in terms of power, and presumably also in terms of expertise) and generally runs the class in a ‘chalk-and-talk’ manner, sitting in front of rows of students, soliciting verbal contributions from individual class participants who read off their respective translations of parts of a text chosen by the teacher. My own experience with this approach dates back to 1983, when I was first introduced to translator education at the School of Applied Linguistics and Cultural Studies (FTSK) of the University of Mainz in Germersheim. The teacher would ask if other students had comments to make and would then provide his or her own commentary on the proposed solutions. This would go on for the duration of class after class, from the first semester through the last of the four-year Diplom (MA level degree) programme of studies. It was ubiquitous for all of the languages taught at the School, and for translation instruction both into and out of the students’ respective native tongue. To my knowledge, observing ongoing classes was the only sort of education or training available to me or any other new instructor at the time. Then, as now, there were no university-level programmes for the education of translation instructors, and at the time, no intensive workshops for translator trainers were being offered anywhere, to my knowledge. A survey of the literature on translator education in 1985-86 revealed that very little had been done up until then to develop teaching approaches that would go beyond attempts to, in some way, essentially transmit knowledge from teachers to students. There was clearly a loose community of translation teaching practice back then, but to my knowledge, there were no underlying theories of translator competence acquisition, and also virtually no research on translator education – at least I have found very little evidence of it in the translation studies literature of the day (Kiraly 1995). Today, some 30 years later, one can still find numerous translation practice classes – and not only at the FTSK – in which a teacher sits in front of perhaps 20 to 60 students seated in rows facing him or her. These students still receive a text that is chosen by the teacher and that the students are expected to translate at home on their own. The main pedagogical activity in these classes is still to read aloud a sentence or short passage from the students’ rough drafts and have it critiqued, particularly by the teacher. The activity is all but devoid of the features of task authenticity that make professional translation a process of resolving real translation problems embedded in a holistic, multi-dimensional context. This context includes competing expectations, demands and standards, interdependencies among myriad actors in authentic situations of interlingual, intercultural communication, and, last but not least – the objective of creating a high-quality product in terms of the standards imposed by a client. As I have already discussed at some length (Kiraly 1995, 2000), the conventional approach referred to by Echeverri and Nord is well-established in translator education institutions in many countries (Toury 1974, Ladmiral 1977, House 1980, Röhl 1983, Enns-Connolly 1986, Gabrian 1986). While considerable criticism has been heaped upon this standard practice in translation teaching, for example by all of the authors referred to above, particularly for the demotivating, passive role it allocates to students, the disempowering, domineering role it attributes to teachers [reflected in Ladmiral's colorful term: performance magistrale (Ladmiral 1977: 508)], and the overall lack of embeddedness in and preparation for the actual professional praxis of translation. And yet, while this instructional practice has been pervasive until recent years, little has been written about where this particular pedagogical technique comes from and why it seems to persist as a mainstay in the education of professional translators. No one seems to have invented it specifically for use in translation practice classes or, at least, there do not seem to be any translation didactic scholars who proudly claim responsibility for having created it. So there is some evidence that the 'Who will take the first sentence?' approach is perhaps indeed based on a folk epistemology and a hand-me-down praxis perpetuated by tradition – and a perceived lack of viable alternatives. This is the topic I propose to broach in this article: what are the respective underlying understandings of the nature of knowledge and learning that underlie this and alternative didactic approaches that are emerging for the 'teaching' of translation? I was inspired to undertake this exploratory foray into the educational philosophy behind different approaches to translator education by the illuminating work on the history of curriculum development by William Doll (2002) and on the history of educational epistemology by Brent Davis (2004), both of whom were writing in reference to education in general, and not specifically translation studies. I was also motivated to delve deeper into this topic when I recently co-edited a collected volume of articles by colleagues of mine in various language departments at the School of Translation, Linguistics and Cultural Studies of the University of Mainz (Hansen-Schirra & Kiraly 2012) and another volume of excellent conference papers presented in a panel on innovation in translator education at a major translation studies conference held in 2012 (Kiraly, Hansen-Schirra & Maksymski 2013). While these two volumes report on an array of highly innovative and convincing learner-centered teaching approaches that go far beyond conventional practice, a striking feature in both of them is the virtual absence of any discussion of pedagogical epistemology, or in fact, of any general educational principles or theory in any of the chapters in the book with just a few exceptions. Echoing Echeverri's (2008) plea, it is my strong conviction that in order to have a justifiable platform for moving beyond the status quo of effete, a-systematic teaching techniques in translator education, we need to establish a dialogue with the broader community of educational theory and praxis and consider its methods, history, failings and successes as we work to improve our own translation-specific pedagogical approaches -- in theory and praxis. I suggest that a suitable starting point for this dialogue would be educational epistemology: the assumptions or beliefs about knowing and 'coming to know' that guide educational praxis. While in previous publications I have already looked extensively at the epistemological underpinnings of a social constructivist approach to translator education (Kiraly 2000) and a post-positivist emergentist approach (Kiraly 2012a), I would like to take this opportunity to contrast what I see as alternative, competing and perhaps incommensurable educational epistemologies and the implications that these differing views may have for translation teaching praxis past, present and future. I will focus largely on the fundamental role that empirico-rationalist epistemology may have played, largely by force of habit and prevalence, in restricting translator education largely to reductionist-transmissionist praxis in the past, and on how an emergentist worldview could well usher in a paradigm shift in the education of translators in the 21st century. Between these two disparate views lie various constructivisms. In terms of my evolving personal educational philosophy, the elucidation and application of a social constructivist approach to facilitating the development of translator competence at the turn of the millennium was a crucial step in my own evolution as a translation teacher beyond conventional transmissionist teaching and towards facilitating learner empowerment. I find that my social constructivist approach, however, has since been superseded, which I suspected was inevitable from the outset due to the evolutionary nature of theory-making from a post-positivist perspective. As the language mediation professions continue to evolve, as new technologies make their way inexorably into the translator's daily routine, and as the paradigms for human understanding change over time in terms of ontology, epistemology, and cosmology, so there will always be a need to continually re-think and reshape our educational theories and praxis. Nonetheless, I see the evolution of my own thinking beyond social constructivism as a re-construal rather than a rejection. 2. What's epistemology got to do with it? This section takes a look at three main epistemological trends, which, as suggested by Doll (2002) and Davis (2004), can be traced in intellectual history as far back as the ancient Greeks: 1) empirico-rationalism, 2) constructivism and 3) emergentism. I will of course only be referring to a few exemplary thinkers that one might associate with these trends, and it should be kept in mind that the characterisation of these individuals as belonging to one or the other group of thinkers is hardly etched in stone. My objective is to illustrate my own construal of epistemological trends and to promote awareness of such trends in translator educators rather than to paint a comprehensive or definitive picture of them. I use the term empirico-rationalism to refer to the positivist, modernist worldview that dates back to the well-known writings of philosophers and scientists of the Enlightenment. It is based on the thinking of two somewhat distinct groups of thinkers: on the one hand, empiricists like Bacon, Locke, Berkeley, Humes, Galileo and Newton, and on the other hand, rationalists like Descartes, Leibniz, Spinoza and Comte (the founder of positivism). While both groups of thinkers sought to come to know the true nature of the world around them, they approached their quest for stable and universal truth from two different directions. The empiricists believed that careful observation (and measurement) of features of the world could enable the perspicacious human mind to discern truth about it (a bottom-up approach to securing truth), whereas the rationalists believed that it is through careful, logical reasoning that we can come to know objective truth about the world (a top-down approach). While the methods of seeking truth for empiricists and rationalists may be different, both believe that knowledge is pre-defined and can be discovered if sought with the proper means and tools. In any event, from a positivist perspective, whereby truth can be found by examining the world directly and/or through reason, the teaching/learning process can essentially be understood as one involving the transmission of objective knowledge – regardless of how the knowledge was originally acquired by the educator. Teachers can be seen as holders of knowledge that they can pass on to their students. This kind of pedagogical activity can, of course, be seen in classrooms in many fields around the world at every level of education. And it is this two-pronged positivist epistemological tradition I believe, that was an important source of the folk pedagogy that still pervades the translation practice classroom. The arguments of the universally recognised philosophers and scientists of the Enlightenment have been bolstered by the writings of numerous thinkers that both preceded and followed them. In fact, both empiricism and rationalism in philosophy and science can be seen to have roots that go back, at least, to ancient Greece. Socrates, Euclid, and Plato are generally seen as rationalists, while Sophist atomists like Epicurus and Democritus can be considered early empiricists. And a century before Descartes came on the scene, the less famous but still very influential pedagogue, French philosopher and Renaissance arts master Petrus Ramus invented the concept of 'method', which he developed within the scope of his pedagogical work (Doll 2008: 182; Triche 2004). A Frenchman of the 16th century, Ramus wrote a treatise on the method elucidating what he believed was the ideal structure for teaching the classics and for passing knowledge on from one generation to the next. Ramus’ ideas on implementing a rigid curriculum and devising strict lesson plans spread quickly from country to country and were handed down from generation to generation. They had an impact on Descartes himself and gradually made their way down through the centuries to modern classrooms around the world through the works of such influential figures as Frederick Taylor in the US at the beginning of the 20th century. Taylor became famous for enhancing manufacturing processes to ensure that the greatest possible amount of productivity could be obtained from each individual industrial worker. While Taylor’s ideas were eventually met with opprobrium in the field of industrial management for their dehumanizing effect on the labourer, they were hailed by educators as a boon to improving education, and were adopted in educational circles and applied to one curriculum after another across the United States and in many other countries. The positivist, reductionist rationale developed by the behaviourist American curriculum specialist Ralph Tyler in the first half of the 20th century, and which drew extensively on Taylorism and the stimulus-response theory of B.F. Skinner, was only discredited in the field of education in the 1990s. And in fact, it continues to play a major role in curriculum development and pedagogical practice even today (Doll 2008: 182; Pinar 2008: 491). Despite having fallen into disrepute as a basis for effective management decades ago, Taylorism still pervades folk pedagogy and has been cited as a key factor in the ills that plague education in the US, for example, with regard to the pervasively excessive emphasis on standardised testing and the obsession with teacher accountability (Roskelly 2009: 201). This transmissionist view of learning underlies the role of the ‘instructor’ in the classroom – the understanding that the teacher must actually possess, in some sense, the knowledge that is to be acquired by the students, and must be able to transmit that knowledge to them efficiently and effectively. From this perspective, interactive classroom discussion, if it functions as anything other than a disturbance in the efficient distribution of knowledge from one brain to the others, provides an opportunity to practice pre-defined skills and consolidate canonical and practical knowledge acquired directly from the teacher or from other expert sources of input. Discussion among the students themselves within this approach is unnecessary and perhaps even harmful. True knowledge about the world can be identified, packaged, transmitted, ingested, accumulated and tested. It is by no means certain that the translation teacher standing in front of a ‘Who will take the first sentence?’ classroom is really aware of the history and tradition that I am suggesting lies behind the unconscious decision to educate future professionals in this fashion. And yet, it has been well established in various sub-fields of education that conventional ‘chalk-and-talk’ teacher-centered instruction is based on an objectivist or positivist epistemology that views the sources and locus of knowledge in a ‘realist’ manner (knowledge understood as a true reflection of the objectively real and directly perceivable world) (Doll 1993, Davis and Sumara 1997). To reiterate: from this perspective: 1) knowledge is to be found in the individual mind (particularly in the teacher's mind in an educational setting); and 2) it represents objective truth about the world that is discoverable through reason and/or through careful observation of reality. There is surely also a tacit understanding that the teacher's professional experience may well have contributed to his or her relevant knowledge. But a quintessential characteristic of this sort of folk pedagogy is that the teacher's expertise can be reduced to axioms, principles, guidelines, rules, and perhaps hints and tricks – in any event 'words of wisdom' that can be received conduit fashion by learners and incorporated into the black box of their minds, located in turn within their brains. From this perspective, translation students' actual experience in dealing with the authentic, situated work of the translator would be of negligible relevance for the learning process – at least during class. Authentic experience might, of course, still be considered an important part of a student's learning activities outside of the classroom, for example during a work placement or once they begin working on the job. But during the period of study per se, it is the students' ability to cognitively retrieve and integrate the truths transmitted by the teacher that counts. From a positivist educational perspective then, learners do not need to experience the messy, complicated real world of professional translation for themselves; it is far more expedient for teachers to distill, simplify and transmit knowledge and skills: the mainstay if not the very essence and raison d’être of modern institutionalised education. It is interesting to note that the 'method' that Nord (1996) proposes to move beyond the folk pedagogy underlying 'Who will take the first sentence?' is fully compatible with Ramus', Taylor's and Tyler's pedagogical approaches. She proposes identifying specific sub-domains of the translator's target competence and specifying the precise content that needs to be taught to build up overall translation competence. She suggests using a Socratic approach to interaction in the classroom (based on Socrates' rationalist view that truth could be known by the teacher and deduced by the students through logic and with the teacher's guidance). I believe that Nord's method does indeed represent a step beyond a common-sense, a-theoretical teaching approach towards an actual educational pedagogy, one that acknowledges its underlying epistemology and builds on a coherent and logical set of principles that can be discussed and assessed by the community of translator educators. And while this is a method that is very much at odds both with a social constructivist and an emergentist approach to facilitating learning, it does represent an epistemologically grounded model for instructionism that may well suit certain teachers, learners and learning situations. What is important, in my view, is not having one particular epistemology or attempting to promote learning in one particular way, but creating and applying coherent and principled pedagogical approaches that can be demonstrated to be viable tools in educational praxis. Some teachers, like me, will surely find that their personal beliefs about the nature of knowing and learning lead them beyond a reductionist, Ramist didactic approach of the type that Nord proposes. Before moving on to summarise briefly the underlying epistemological tenets of social constructivism, it is important here, I feel, to reiterate some of the key differences between Piaget's radical constructivism and Vygotsky's social constructivism. While the former can be seen as still being tied to a rather positivist worldview, the latter I construe to be firmly in the post-positivist realm. Both theories suggest that we learn most often not by ingesting truth discovered empirically or rationally, but by creating our own understandings of the world. For Piaget, this was largely a process of individual cognition (which, in turn, allows for social interaction), whereas for Vygotsky, it is social interaction that precedes and leads to thought. For Vygotsky, learning is much more a matter of construing (that is, interpreting) the world than it is a matter of constructing knowledge about the world. In the social constructivist theory that is closely linked to the Russian polymath Lev Vygotsky, the world is interpreted by individuals in and through social interaction. The first radical constructivist perspective, dating back to ancient Greece, has been attributed to the Sophist Protagoras in the fifth century BC. Protagoras is famous for a statement to the effect that: 'Man is the measure of all things', which has been interpreted as suggesting a relativist philosophical view of man's relationship to knowledge. During the Enlightenment period, it was Giambattista Vico (1668-1744), an Italian political philosopher, rhetorician, historian and jurist who developed an epistemology that represented a distinct contrast to reductionism. In one of his major works, published in 1710, Vico introduced and defended his famous verum factum principle (stating that only that which is made can be known to be true), which was based on the view that knowledge derives from creation or invention and not from observation. From such a perspective, learning is far less a matter of acquisition or the intake of input, and far more a process of contextualised, situated, re-construction of the self (a more experienced, competent, autonomous self). While both radical and social constructivism emphasize the need for embodied action as the basis for learning, social constructivism adds the primordial interpersonal component in coming to know and becoming. It is dependent on authentic and collaborative interaction as an essential feature of an effective learning environment. Although social constructivism holds that sense and knowledge are created in interaction with one’s social environment and hence emerge from the interstices of interpersonal interaction, in the end, the individual mind is still the place where knowledge is ‘constructed’ and stored. In addition, the construction metaphor still emphasizes the reification of knowledge and the understanding that the processes at work are largely mechanical: simple or complicated at best. As I hope to show in the final section of this article, the step beyond constructivism towards emergent knowing represents a significant move beyond the mechanistic, positivist, reductionist worldview that has dominated education for centuries – towards an approach that acknowledges the non-linear and unpredictable nature of authentic (non-reductionist) learning systems. 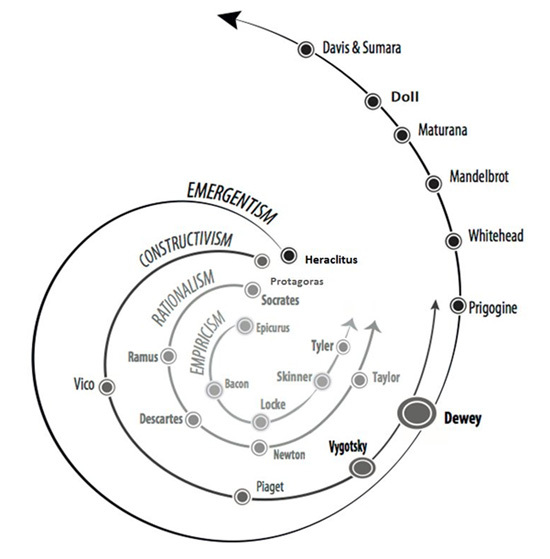 In addition to his contribution to social constructivist thought, Dewey's work on metaphysics has also been identified as an important contribution to the process philosophy that developed initially at the end of the 19th century and was championed by the renowned British mathematician and philosopher Alfred North Whitehead (Whitehead 1950). This philosophical perspective sees the world in evolutionary terms as being in constant flux – as Heraclitus did in ancient Greece according to the dictum attributed to him to the effect that: no man can step into the same river twice (Kenny 210: 17). Process philosophy re-emerged late in the 20th century as complexity science and thinking, which are currently being investigated in a range of natural and social science domains. In the final section of this paper, I will revisit complexity theory and the concept of emergence as I have started to apply them to translator education. In this section, which, because of space limitations, can at best whet the appetite of readers interested in delving deeper into post-positivist options in translator education, I have taken the liberty of quoting others extensively in order to introduce readers to a few of the many eloquent voices in the domains of educational philosophy and pedagogical research that are contributing to dialogue within post-positivist communities of educational theory and practice in a number of domains. I believe that these voices can contribute to a viable epistemological foundation for the increasing number of translation teachers who find themselves disenchanted with chalk-and-talk practice in the classroom and who find themselves drawn towards collaborative, situated, praxis-oriented pedagogy. The first voice is that of Hanna Risku, who, to my knowledge, is one of the very few other translation studies scholars to date who has come out unequivocally in favour of adopting a post-positivist epistemology for furthering translator education. The postmodern perspective of curriculum respects the messiness of the whole and does not try to justify and segment parts of the whole into closed boxes. In this open framework, there is room for play, chance, and the turmoil inherent in learning. Learning does not always have to proceed in sequential steps, but is complex and moves in fits and starts. The postmodern paradigm embraces exceptions and does not feel a need to find the ultimate truth (Lewis 2004: 121-122). An emergentist view not only allows but requires teachers to climb down from their pedestals of authority, and it implies an obligatory change in their roles from distillers and transmitters of knowledge to guides and companions on the students’ road to experience. Syllabus design is no longer a task to be accomplished by a teacher alone prior to the start of a course; it becomes a tentative plan that emerges with new challenges and unexpected turns, and one leading to unpredictable goals as a course progresses. Learning objectives become far more difficult to specify because they will differ from student to student and will, in the best of cases, evolve in a unique manner for each student throughout each course and throughout the entire programme of studies. So a change in our underlying pedagogical epistemology, in our basic understanding of what it means to learn how to function as a language mediation professional, will bring with it a plethora of new challenges for teachers, learners and our educational institutions themselves. This, however, would be a small price to pay for a pedagogy that is far better suited than chalk-and-talk to the still-emerging postmodern Zeitgeist. It has not been my intention in this short survey to tell a complete story of anything, but rather to encourage my readers, and particularly those who are or who intend to become, translator educators, to investigate their own epistemologies of pedagogical practice. Just as is the case for translation students, for whom we know that one does not learn to translate merely by translating, so do translation teachers not become master educators merely by teaching. Reflection is also a vital component of the equation. I hope to have demonstrated that by looking back at educational thought for a few dozen, hundred or thousand years, we can better judge what kind of educators we are, and what kind we would like to become in order to serve our students, institutions and society in the future. Figure 1 depicts just a few of the dialogue partners I have found to be particularly edifying over the course of my own personal quest to better understand some of the complexities of learning and teaching. Bereiter, Carl and Marlene Scardamaglia (1993) Surpassing Ourselves – An Inquiry into the Nature and Explications of Expertise, Chicago & Lasalle, Illinois, Open Court. Bruner, Jerome (2006) In Search of Pedagogy Volume II, New York, Routledge. Davis, Brent 2004 Inventions of Teaching, Mahwah, N.J., L. Earlbaum Associates. Davis, Brent, and Dennis Sumara (1997) "Cognition, complexity, and teacher education", Harvard Educational Review 67, no. 1: 105–125. ------ (2007) "Complexity Science and Education: Reconceptualizing the Teacher’s Role in Learning", Interchange 38, no. 1: 53–67. ------ (2008) “Complexity as a Theory of Education.” Transnational Curriculum Inquiry 5, no. 2, URL: http://nitainat.library.ubc.ca/ojs/index.php/tci (accessed 5 January 2013). Doll, William E. 1993 A Postmodern Perspective on Curriculum, New York, Teachers College Press. ------ (2002) "Ghosts and the Curriculum" in Curriculum Visions, William Doll and Noel Gough (eds), New York, Peter Lang. ------ (2008) “Complexity and the Culture of Curriculum” in Complexity Theory and the Philosophy of Education, Mark Mason (ed. ), Malden, Georgia, Wiley-Blackwell: 181–203. Echeverri, Álvaro (2008) "Énième Plaidoyer Pour L’innovation Dans Les Cours Pratiques de Traduction. Préalables à L’innovation? ", TTR: Traduction, Terminologie, Rédaction 21, no. 1: 65–98. Enns-Conolly, Esther (1986) Translation as an Interpretive Act: A Narrative Study of Translation in University Level Foreign Language Teaching, Ph.D. Disssertation, University of Toronto. Gabrian , Britta (1986) "Ziel oder Zeillosigkeit des Übersetzungsunterricht" in TextKontext 1, no. 1: 48–62. Hansen-Schirra, Silvia and Don Kiraly (eds) (2012) Projekte und Projektionen in der translatorischen Kompetenzentwicklung, Frankfurt, Peter Lang. House, Juliane (1980) "Übersetzen im Fremdsprachenunterricht" in Angewandte Übersetzungswissenschaft, S. O. Poulsen and Wolfram Wilss (eds) Arhus, Wirtschaftsuniversität Arhus: 7–17. Kenny, Anthony (2010) A New History of Western Philosophy, Oxford, OUP. Kiraly, Don (1995) Pathways to Translation: Pedagogy and Process. Kent, Ohio, Kent State University Press. ------ (2000) A Social Constructivist Approach to Translator Education. Manchester: St. Jerome. ------ (2012a) “Growing a Project-Based Translation Pedagogy.” META 57 (1): 82–95. ------ (2012b) “Skopos Theory Goes to Paris: Purposeful Translation and Emergent Translation Projects”, MTM 4: 119–144. Kiraly, Don, Silvia Hansen-Schirra, Karin Maksymski (eds) (2013) New Prospects and Perspectivs for Educating Language Mediators, Tübingen, Narr Verlag. Ladmiral, J R (1977) "La traduction dans le cadre de l'institution pédagogique", Die Neueren Sprachen 76: 489–516. Lewis, Nancy S. (2004) “The Intersection of Postmodernity and Classroom Practice.” Teacher Education Quarterly Summer: 119–134. Mackenzie, Rosemary and Elina Nieminen (1997) “Motivating students to achieve quality in translation” in Transferre Necesse Est, Kinga Klaudy, and Janós Kohn (eds), Budapest, Scholastica: 339–344. Mandelbrot, Benoît B. (1983) The Fractal Geometry of Nature, New York, Henry Holt & Company. Maturana, Umberto and Francisco Varela (1980) Autopoiesis and Cognition: the Realization of the Living. Boston: D. Reidel Publishing Co.
Morçöl, Göktu (2001) “What is Complexity Science? Postmodernist or Postpositivist?”, Emergence 3, no. 1: 104–119. Nord, Christiane (1996) "Wer nimmt denn mal den ersten Satz? Überlegungen zu neuen Arbeitsformen im Übersetzungsunterricht". In: H. Gerzymisch-Arbogast, J. Haller & E. Steiner (eds) Übersetzungswissenschaft im Umbruch, Festschrift für Wolfram Wilss, Tübingen, Narr: 313–327. Pinar, William (2008) "Curriculum theory since 1950: Crisis, reconceptualization, internationalization" in The SAGE Handbook of Curriculum and Instruction, F. Connelly, M. He, & J. Phillion (eds), Los Angeles, Sage Publications: 491–514. Risku, Hanna (1998) Translatorische Kompetenz, Tübingen, Stauffenberg. ------ (2010) “A Cognitive Scientific View on Technical Communication and Translation. Do embodiment and situatedness really make a difference? Target 22, no. 1: 94–111. Röhl, Monika (1983) Ansätze zu einer Didaktik des Übersetzens, MA thesis, Johannes Gutenberg- Universität, Mainz. Roskelly, Hephzibah (2009) "Teaching Like Weasels", in Education and Hope in Troubled Times, in Education and Hope in Troubled Times, Sri Shapiro (ed. ), London, Routledge: 198–209. Sumara, Dennis and Brent Davis (1997) "Enactivist Theory and Community Learning: toward a complexified understanding of action research", Educational Action Research 5, no. 3: 403–422. Toury, Gideon (1974) "The Notion of Native Translator and Translation Teaching, in Die Theorie des Übersetzens und ihr Aufschlußwert für die Übersetzungs- und Dolmetschdidaktik, Wolfram Wilss and Gisela Thome (eds), Tübingen, Gunter Narr: 186–95. Triche, Stephen and Douglas McKnight (2004) “The Quest for Method: the Legacy of Peter Ramus.” History of Education 33, no. 1: 39–54. Trueit, Donna (2012) Pragmatism, Postmodernism, and Complexity Theory, New York and London, Routledge. Varbelow, Sonja (2012) "Instruction, Curriculum and Society: Iterations Based on the Ideas of William Doll" International Journal of Instruction 5, no. 1: 87–94. Vienne, Jean (1994) "Toward a Pedagogy of Translation in Situation" Perspectives 1: 51–59. Weaver, Warren (1948) "Science and Complexity", American Scientist 36, no. 4: 536–544. Whitehead, Alfred North (1950) The Aims of Education and Other Essays, London, E. Benn. The concept derives from the term ‘community of practice’ coined by Jean Lave and Etienne Wenger. A ‘community of theory and praxis’ emphasizes the reflective nature of the community's work, and 'praxis', I believe, more clearly emphasizes the mindful nature of the work at hand and avoids the ambiguity inherent in the term "practice" (with its second key denotation of repetitive exercise). Intensive workshops have since been run, (for example those organised and co-taught by the author) between 1999 and 2006 at the Monterey Institute of International Studies in the US and at the Universities of Tarragona and Vic in Spain. There now also exists a single master’s degree in translation pedagogy: the one created recently at Macquarie University in Australia, but even that one has been offered only intermittently, because of a lack of students. This thorough study on teaching approaches in translator education was the graduate thesis by Röhl (1983) completed at the FTSK. It turned out to be a key impetus behind my dissertation work, which was completed at the University of Illinois. Throughout this paper, the term epistemology will be used to refer to ‘theories of knowing and learning’ despite the possibility that some postmodernists may understand epistemology in Cartesian terms as being about how we know and come to know the world objectively. I use the term educational epistemology to emphasize the utilisation of epistemological principles in the service of fostering learning. Empiricism and rationalism can, of course, be depicted as distinct epistemologies as they see truth as being accessible in two radically different ways: through the senses or through reasoning respectively. Nevertheless, both views see truth as being discoverable, identifiable, accessible and retrievable; the upshot are the common features of teaching approaches based on empiricist and rationalist views: teacher-centered instruction. The history of Western modernism from an educational perspective has been discussed at length and in depth in the works of William Doll (Trueit 2012). I will not even broach the topic of links between Western and Eastern epistemological thought here, but will be doing so in forthcoming publications. The term instructionism is attributed to Seymour Papert (1993). Space limitations prohibit me from reviewing the social constructivist perspective in detail. The reader is referred to A Social Constructivist Approach to Translator Education (Kiraly 2000) for a thorough discussion of social constructivist theory and its application to translator education. translator education is his emphasis on authentic project work as a stepping stone towards life as a language professional beyond the ivory tower.